Obama: Health Care Site Is Troubled; Affordable Care Act Is Not : The Two-Way "There's no sugarcoating it: The website has been too slow" and confusing, President Obama said Monday. But he says the Affordable Care Act is working for Americans and that the problems will be fixed. "There's no sugarcoating it: The website has been too slow," President Obama said at the White House on Monday. 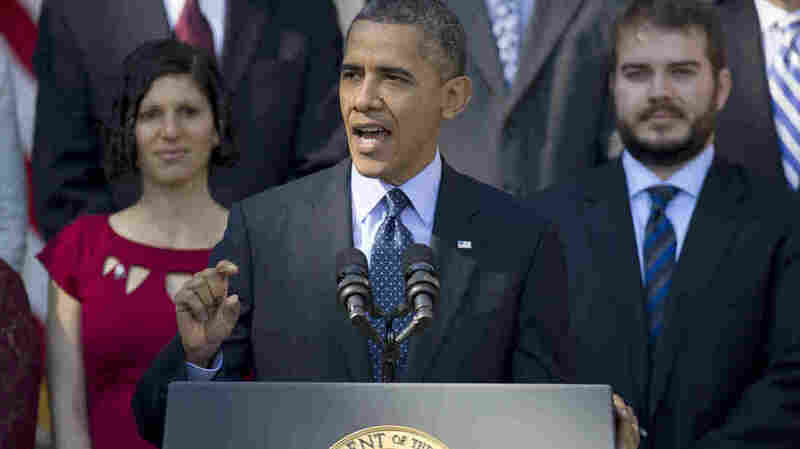 Obama said the health care system's online problems are being addressed. The website that's meant to allow Americans to shop and sign up for new medical plans under the Affordable Care Act isn't working as well as it should, President Obama says. But he promised that the problems will be fixed — and he said the Affordable Care Act is bringing many benefits that aren't tied to those problems. "Nobody is madder than me that the website isn't working as it should — which means that it's going to get fixed," Obama told a crowd at an outdoor address at the White House. Since it went into effect at the start of October, the new system's HealthCare.gov website has been the subject of numerous complaints, as many users reported problems creating an account or logging in. Others say they got confusing error messages. Acknowledging the problems Monday, the president said, "There's no sugarcoating it: The website has been too slow" and people have had trouble navigating it. The problems were "aggravated" by the high level of traffic to the website, Obama said. After initially resisting Republicans' requests to testify about the Affordable Care Act in Congress this week, Health and Human Services Secretary Kathleen Sebelius will appear before a House panel discuss the problems with the website. "HHS officials said Sebelius had a scheduling conflict and could not appear at a hearing called this Thursday by the House Energy and Commerce Committee. But with pressure building over problems with the website the federal government built to enroll people in 36 states, HHS now says the secretary will work with the committee to find a day for her or other department officials to appear as early as next week." As The Hill reports, House Speaker John Boehner and other Republicans have been pressing Sebelius to testify. "Americans are looking for accountability," Boehner said after the president's remarks today. The HealthCare.gov website has attracted more than 19 million unique visits, the Department of Health and Human Services reported Sunday. But the agency acknowledged that the online experience has been "frustrating." An early attempt to address the online system's problems backfired, when "a virtual 'waiting room' " caused more confusion, HHS said. The president spoke in the Rose Garden at the White House in an address that began around 11:30 a.m. ET. He was introduced by small-business owner Janice Baker, the first person to enroll in the new health program in the state of Delaware. Baker said she is saving money on the new plan. Reading letters aloud with similar stories, the president said the problems aren't with the Affordable Care Act but with the website — and that those issues are being addressed. And he said the health care overhaul has already begun helping Americans, such as senior citizens who Obama says are now saving money on their prescriptions. "You may not have noticed them, but you've got them," the president said of such benefits. And, he said, "they're not connected to a website." The president also stressed that the signup process has just begun for the coverage plans, which are set to take effect in January. And he said his administration has added more staff to call centers to help people who have questions or problems using the system. "We've got people working overtime, 24-7," he said. Obama recited the phone number — twice — for those call centers: 1-800-318-2596. "You can talk to someone directly, and they can walk you through the application process," he said. A prominent link to that and other phone numbers was added to HealthCare.gov over the weekend. The Department of Health and Human Services says it is "defining new test processes to prevent new issues from cropping up as we improve the overall service and deploying fixes to the site during off-peak hours on a regular basis." If you're curious about the plans, you could also use NPR's Obamacare cost calculator, which we published last month.